In March 2017 we polled Australia’s top NFPs on their funding strategies, gaining valuable insight into how we can help the sector become more sustainable. The results demonstrated clear trends. Very few NFP organisations have explored alternative funding options, and although the majority of NFPs are not solely dependent on current government policy, over 50% are funded by a single source, leaving them at risk. Encouragingly, we’re starting to see increased openness to cross-sector partnerships, which can be a key factor to long-term organisational sustainability. Likewise, more organisations than ever are taking the time to determine what their value proposition truly is, which is critical to succes. Overall, the data from our poll demonstrates that there are great opportunities here for NFPs to start thinking outside of the box and move beyond traditional funding models. Value is at the heart of any organisation, yet the overwhelming majority of respondents conveyed that this was not crystal clear within their own business model. This highlights the importance of nailing what problem you intend to solve. 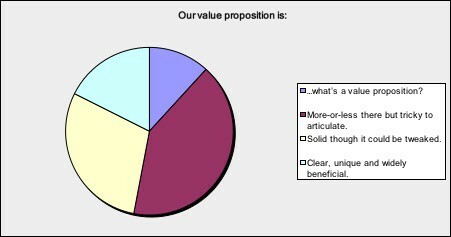 12% = …what’s a value proposition? 41% = More-or-less there but tricky to articulate. 29% = Solid though it could be tweaked. 18% = Clear, unique and widely beneficial. Singular funding is commonplace. In terms of alternative funding models, the conversation seems to be that organisations are starting to do this, but it’s not yet common practice. 12% = Robust – we’re 99% safe for the next five years. 12% = Diverse – if we lost any of our main sources we’d still be fine. 24% = Risky – we could probably survive without our main three sources. 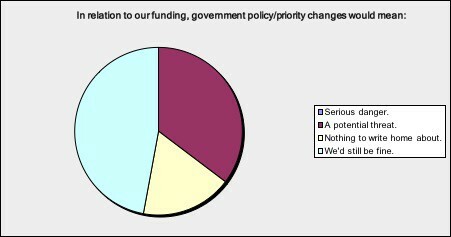 54% = Singular – if we lose our primary funding we’re in big trouble. The majority of organisations are dependent on grants, yet an encouraging trend towards service delivery income demonstrates a move towards diversity and improving business acumen. Society is increasingly moving away from reliance on government support for social impact, with just over a third of respondents reporting that policy and priority changes would represent a potential threat. 35% = A potential threat. 18% = Nothing to write home about. 47% = We’d still be fine. 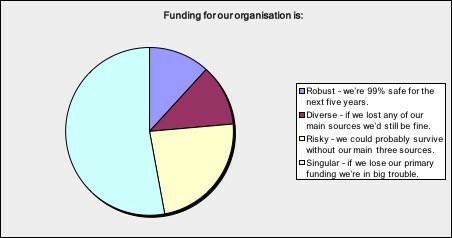 Opportunities for alternative funding models are abundant, yet very few organisations are leveraging this potential. Wider trends in the sector demonstrate that traditional funding models are increasingly unreliable, meaning that pursuing alternative funding models is imperative. 6% = Exhaustively – no stone left unturned. 24% = To a high degree – we’ve spent a lot of time on this. 59% = Slightly – we’ve looked into it, but could do more. 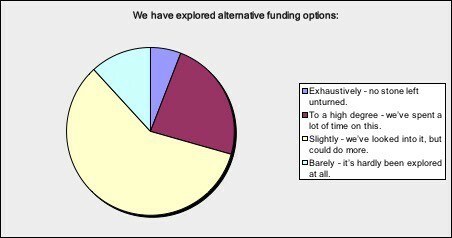 11% = Barely – it’s hardly been explored at all. While alternative funding models remain relatively unleveraged, the NFP sector as a whole is shifting towards an openness towards income diversity in response to yesterday’s sources becoming increasingly less fruitful. 0% = Keep dreaming – we’re certain there’s nothing new out there to help us. 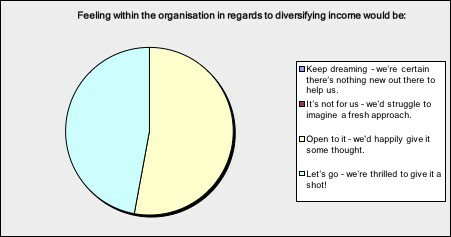 0% = It’s not for us – we’d struggle to imagine a fresh approach. 53% = Open to it – we’d happily give it some thought. 47% = Let’s go – we’re thrilled to give it a shot! Building on trends around funding and income illustrated by the previous two questions, the vast majority of senior NFP leadership are forecasting widespread organisational buy-in if they were to launch a commercial spin-off. 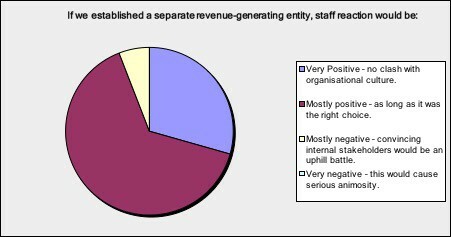 29% = Very Positive – no clash with organisational culture. 65% = Mostly positive – as long as it was the right choice. 6% = Mostly negative – convincing internal stakeholders will be an uphill battle. 0% = Very negative – this would cause serious animosity. 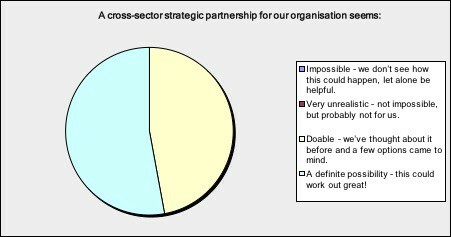 0% = Impossible – we don’t see how this could happen, let alone be helpful. 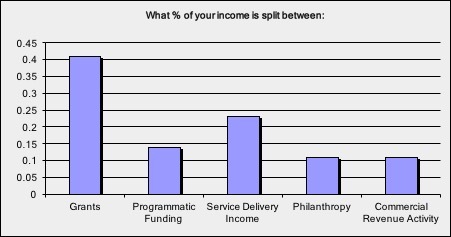 0% = Very unrealistic – not impossible, but probably not for us. 47% = Doable – we’ve thought about it before and a few options came to mind. 53% = A definite possibility – this could work out great! 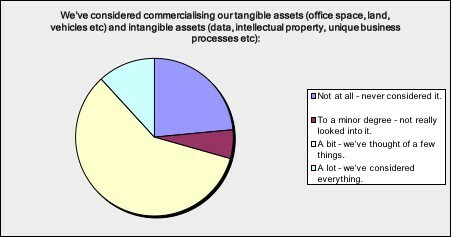 While the majority of respondents are not strangers to the concept of commercialising their assets, the data shows that very few organisations have exhaustively researched the “hidden treasure” within their organisations. 24% = Not at all – never considered it. 6% = To a minor degree – not really looked into it. 59% = A bit – we’ve thought of a few things. 11% = A lot – we’ve considered everything. Social trends show that the sector is currently going through seismic shifts, meaning that a sustainable business model is increasingly important to get through the coming years. Exploring partnerships, alternative funding options and income diversification is crucial. We hope the above information proves insightful towards improving your funding model. It’s important to remember that developing a sustainable business model is a journey; the first step is often the hardest. If you’d like to gain further insight into what those steps may be for your organisation, please click here to answer the multiple choice poll and we’ll send you an individualised report. If you would like a deeper conversation on your strategy or business model, please don’t hesitate to contact us. Interested in learning more about business strategy and sustainable business models?